Boat Crunch Compact, Mini and Small Pontoon Boats – The Top Benefits! 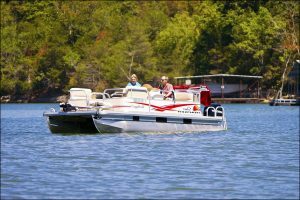 Compact, Mini and Small Pontoon Boats – The Top Benefits! There are various types of different pontoon boats, they all come in different shapes and sizes. There’s a type for everyone. As of recently, small pontoon boats have become increasingly popular. But why is it that these mini pontoon boats are so great? These more compact pontoons are nothing new; they’ve been about for many years. Though, people are only now realizing that there are many benefits and advantages of driving these smaller pontoons. The saying ‘Bigger is better’ has never been more wrong. When it comes to boats, everything comes down to preference and needs. Not everyone will need or want a full-sized boat, some will rather reap the benefits of a compact boat. In this article, I’ll be explaining a few of the biggest advantages of owning a compact, mini, or small pontoon boat. There are three different types of compact pontoon boats. These are compact, narrow, and mini. Despite them all sharing the same similarly of being compact and not full-sized pontoons, they all have their own specifications and strengths. In this section I’ll provide a brief description of each type of pontoon. Compact pontoon boats will range anywhere from 10 ft to 20 ft in length. They will also have a beam of up to 8 feet. The deck can vary from 100 to 170 sq (Square feet). Compact pontoons are large enough to fit a small family in, so if you have a family of up to 4 members and want to go boating on a budget then this is a good choice for you. As the name suggests, a narrow pontoon will be narrower than the average pontoon. A narrow pontoon boat will have a beam of around 7 feet (About 6 to 8 ft). Whereas the average pontoon would have a beam of about 9 ft standard. This makes narrow pontoons great for boating on narrow bodies of water such as rivers. This is the smallest type of pontoon possible. It’s absolutely tiny with a square foot of around 50! This is certainly not the best type of boat for a family. Though, it would be a great idea for a couple. Generally, you’re only going to be able to fit about 2 people on board and minimal equipment. These boats can be great if you really don’t need much space, but I find them very impractical. I like to have more flexibility with my boats. Despite my opinion, I know of many people who are satisfied with their mini pontoon boat. They make for a calm and quiet fishing trip. One important thing you should bare in mind with mini boats is that they’re not built for open waters. They’re meant for fishing on ponds. Avalon are a well-known pontoon boat manufacturer from the USA who’s been around since 1972. They’ve always strived to provide the highest possible quality pontoon boats. They specialize in high-end luxury boats which provide outstanding value for money. One of their best compact pontoon boats must be the Eagle. This is a fun sized, affordable luxury pontoon boat with many awesome fishing options available. It comes in three different lengths, 14 ft, 16 ft, 18 ft, and 20 ft. The 14 ft variation has a maximum people capacity of 5, whereas the 20 ft variation allows for up to 9. The Eagle is a very popular model and is perfect for boating on smaller lakes. 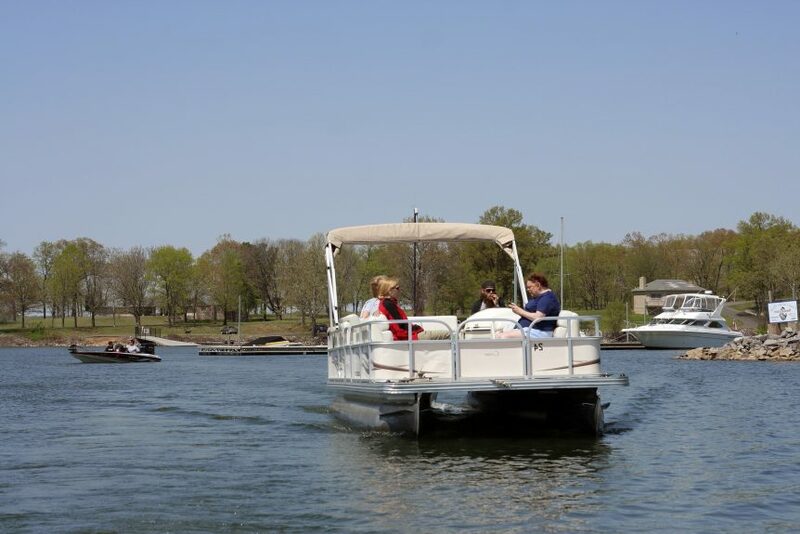 This pontoon has a wide variety of different features which make the purchase even more tempting. You can find more information on this boat by clicking here. Bennington is another popular pontoon manufacturer that’s been in the game size 1997. They started off as a small collective of industry veterans with the intention of building a boat brand who produced outstandingly well built compact boats. Bennington boats are arguably some of the most luxurious compact boats on the market. This is evident with the S16 Narrow Beam Pontoon. Bennington’s Narrow-Beam series are known for being very easy to trailer and fit into smaller storage’s due to their 8’ wide deck and hull. The boat may be minuscule though, it’s in-fact surprisingly spacious and comfortable. Compact pontoons are not limited to civilians, but they’re also widely used by official organisations. 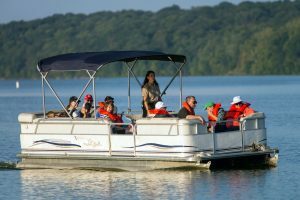 Law enforcement and the recreation department are common users of pontoon boats. I’ll explain why they’re so useful to these departments. Law enforcement often use compact pontoons due to their light weight. This is useful to them as it means that the boats can pick up more speed. This is key for rescue missions as people’s lives are at risk, and it’s important that officers can arrive to the scene in a timely manner. Also, emergency services never know how difficult it may be to reach victims, so it’s a good idea to bring a smaller and more manoeuvrable boat. As well as law enforcement, the department of parks and creation also use compact pontoons. It’s common for park rangers to have to clean up junk in difficult to reach places such as narrow creeks. A full-sized pontoon would have difficulty getting into these spots. Because of this, it makes sense for them to use compact toons which can fit into these tighter waters. This is the section of the guide you were probably most interested in! Here, I’ll be explaining the main advantages of small, compact, and mini pontoons boats. The first advantage of compact pontoons is there stability. Due to the size of the boat, they produce a very small draft. They also have a flat deck which prevents the boat from rocking. This will keep you and any equipment you have on board nice and still. This helps prevent motion sickness, and generally makes boating more comfortable. Another reason this is great is because having a smaller wake will disturb the water less, and thus scare away less fish. This means that you’re more likely to have better luck fishing in a smaller boat. Due to the compact size of these pontoons, they don’t take up very much space. This allows for them to be stored in smaller or more cramped conditions than a full-sized pontoon. This provides you with more flexibility as to where you can store your pontoon. Instead of paying for winter storage, you could instead store your boat in your garage. You could even store it in your shed if it’s big enough. One of my favorite things about small pontoons is that they have great maneuverability. I mean this in terms of being able to handle your boat with ease. Often with full-sized boats you can run into trouble when docking and trailering as they’re very large and bulky. None of this should be a problem with a small pontoon. Another advantage is that you don’t need a super powerful trailer to tow your boat. You could even use your RV if you have one. Due to the size and weight of a small pontoon, this isn’t a problem. Whereas, with a full-sized pontoon you may have to purchase or rent a truck with a stronger engine. When it comes to most things in life, it’s often better to start small before you join the big boys. Small pontoons are great for getting the grip of things as a boat owner. It’s important to test the waters before you dive straight in. Full-sized pontoon boats aren’t cheap, they can be hefty investments. Therefore, it’d be a good idea to start off with an affordable compact pontoon. You may find that you don’t need a bigger boat, and you’re satisfied with a compact pontoon. Though, from owning a smaller boat you may realise that you need more space and want to upgrade to a full-sized boat. Regardless, by owning a small boat you’ll be provided with the experience of boat ownership. You’ll gain valuable skills and knowledge that come with the ownership of a boat. For example, you’ll understand how to launch, store, and maintain a boat. You may find that various lakes will have restrictions on horsepower. This is often because of the size of the lake, however there may also be environmental regulations in place to protect the environment. This is an advantage of having a small pontoon boat, as you’ll likely be within horsepower restrictions. Bear in mind, that just because compact pontoons generally have lower horsepower, doesn’t mean that they’re slower than full-sized pontoons. They weight a lot less, so they can still reach sufficient speeds. This leads me to my last point. Because these pontoons are so small, they don’t always have a diesel engine. Instead, some use electric motors which are significantly more environmentally friendly. Though your engine won’t be as powerful, you don’t need a very power engine due to the lightweight of the boat.